Saw one today at Wally World and kinda liked it, but $45 was just a bit more than I was looking to spend on a splurge knife. The guy behind the counter said it for me with "I've got two in stock, they've been here for a year, and at almost $50, they're not gonna sell. So I'm marking them down as discontinued and display items, and it'll take 24 hours to go into the computer, but if you want to come in tomorrow, it should be anywhere from 30-50% off." These two are some special model they got a few years ago in flat blue Delrin scales with the texturing, and the logo has an American flag background. I felt like buying an American made knife and it spoke to me. So I'll be picking one up in blue, probably. I just want a gentleman's knife life the one my grandfather used to carry. The Spydercos are quick to deploy, but damn they attract attention and get people looking when I just want to cut something in public. Anyway, to make good on his promise, he marked down a Ontario Model 499 down to $19 from $39, so I snagged it. I told him I'd be back for the Case tomorrow. 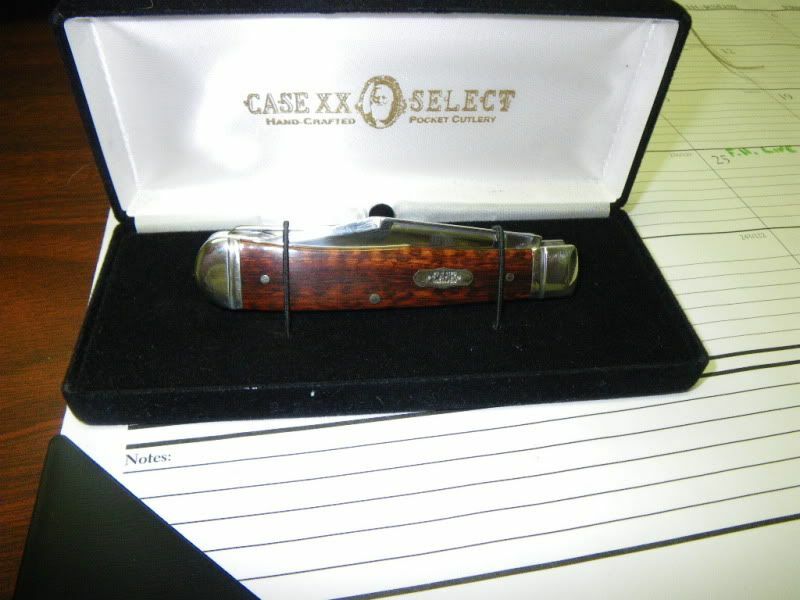 I've never owned a Case knife, and my grandfather had a number of them, and Schrades. When I turned 10, he gave me a Shrade Old Timer 50T that I took close care of and still have. Just something about those kind of knives. 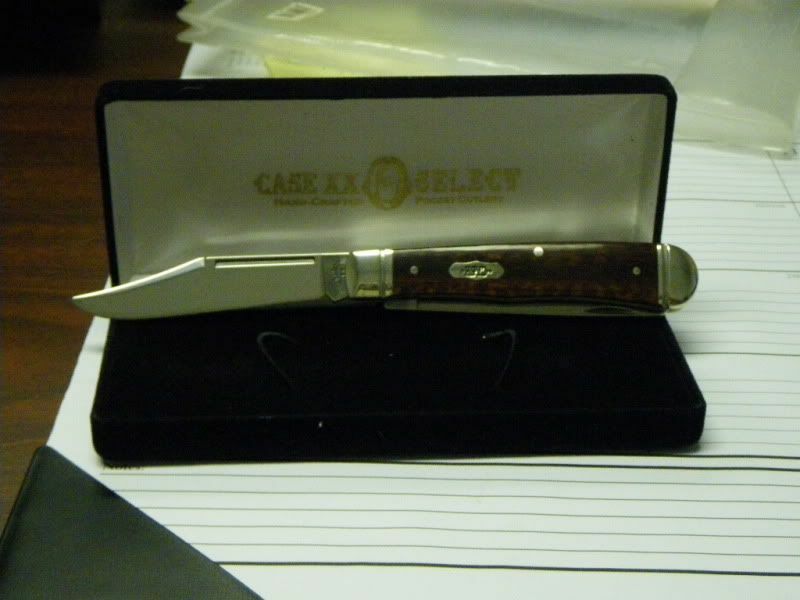 I have a couple of their Trappers but prefer the Case Jumbo Stockman. I’m surprised Walmart has that good of a knife on hand. They seem to specialize in Timmy Tactical crap from china at their stores around here. And chinese “Winchester” marked hunting knives. Yeah, I was surprised also, which is why I went ahead and waited a good twenty minutes behind two guys getting their fishing licenses to actually look it over and see if it was a real one. I just looked up the Jumbo Stockman. I was given a secondhand, worn-out miniature version of that configuration knife with the one on the end broken off when I was a kiddo. I'll have to dig it out, see if it's a Case or not. I suspect not. I liked that knife, maybe I'll have to try a Jumbo Stockman. I like the idea of multiple utility blades in one "nobody panic" knife. I like them. It was one of my grandfather’s favorite models and I can’t count the number of times he whittled something for me with it or skinned squirrels. I picked up a stag handle version a few years ago but don’t carry it much - bought it more because he always carried one. Sounds like a great deal with the discount. I snagged it for $20, couldn't say no! The manager I dealt with both yesterday and today said to check back later this month, they were doing a reset on their knives. He showed me one they had with bone handles and some scene of maybe a father and son fishing. May snag that one and set it aside for my son when he's old enough. I like this knife! Fit and finish are nice, both blades are reasonably well centered and open smoothly. Haven't cut anything with it yet, but it feels really good in the hand. Feels like it'll be a solid performer and something I won't feel awkward using in public, especially the spey point blade. Much less attention-getting than a Manix 2 XL! I love trappers. I like them better than stockmans because I think their two full-sized blades are more useful than the smaller two blades on a stockman. What's ironic is the fact that I currently have several stockmans of different sizes, and no trappers. Go figure. Agreed. In fact, I would have paid the $40 without complaint. $20 is a steal. I love Case knives in general. I bought out a large collection recently from a family member. Case collector here. I've a few. Primarily like trappers, saddlehorns and large folding hunters. For years i carried a trapper. When the trapperlock was made it replaced my trapper, and it is my edc nowaday. One handed opening, and locking blade is important to me. I love case knives. $40 is cheap compared to what a plastic handled benchmade goes for. Bought a Trapper because of you guys. I really like it. I got the smaller version for easy carry. Now, I want the single blade variety. They remind me of my granddad's old pocket knives. 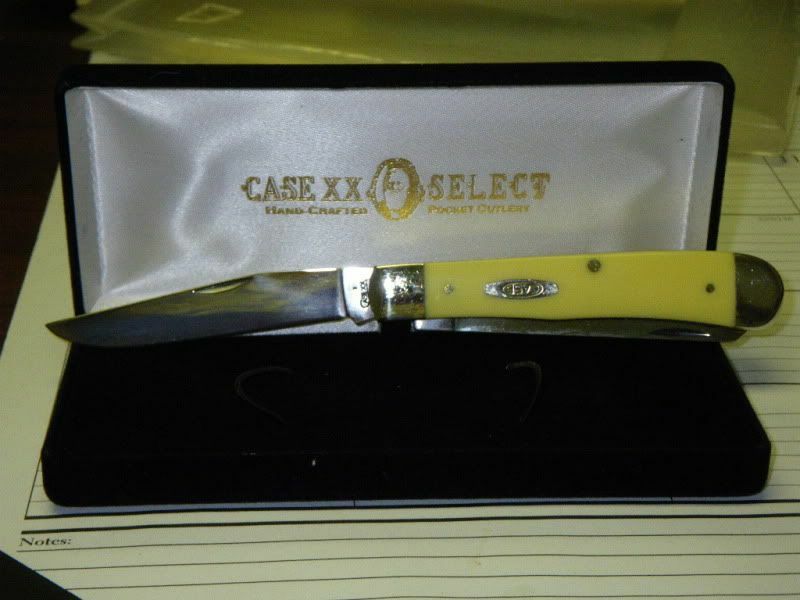 I give yellow handles Case trappers as graduation presents. My local private hardware store sells them for around $30 before Christmas and I stock up. I like single blade trappers best in traditional slip joints. I'm torn. I like the trappers, but I'm a big fan of the stockmans as well. But then I like the canoes, baby butterbeans, eisenhowers, and on and on. I had a Case from the mid-late sixties when I was in my teens, and I haven't seen it for years. It was a favorite. It's killing me that I can't remember what happened to it. It's probably in a box of stuff from my parents' house that I'll find someday. I went back and asked the lady working the counter about the one I had looked at with the bone scales and the father and son fishing laser etch. She pulled it out of the bottom back of the cabinet and sure enough, it had a clearance sticker on it for $17, down from $40 something. She didn't want to sell it to me for that price and got really flustered when she scanned both bar codes and it came up discontinued/clearanced. "Well, I'll buy it now for that price. If you don't feel comfortable going with what the computer says, I can come back and talk to him tomorrow." I got my second Trapper for $17.52 + tax. So for many of the evenings over the last few months, I've been sitting on the back deck whittling on dried pine branches while my son plays, mentally flipping a coin on which Trapper I feel like using. Early on, the bone handled version caught his eye and he came up and said "Dad, I like that one" and smiled when I pointed out that the etching was a father teaching his son to fish, so I guess I know which one to keep nice for him when he's old enough. He's four now, so it'll be a little while. In the meantime, I figure forming some memories with it for him is a decent path to take. 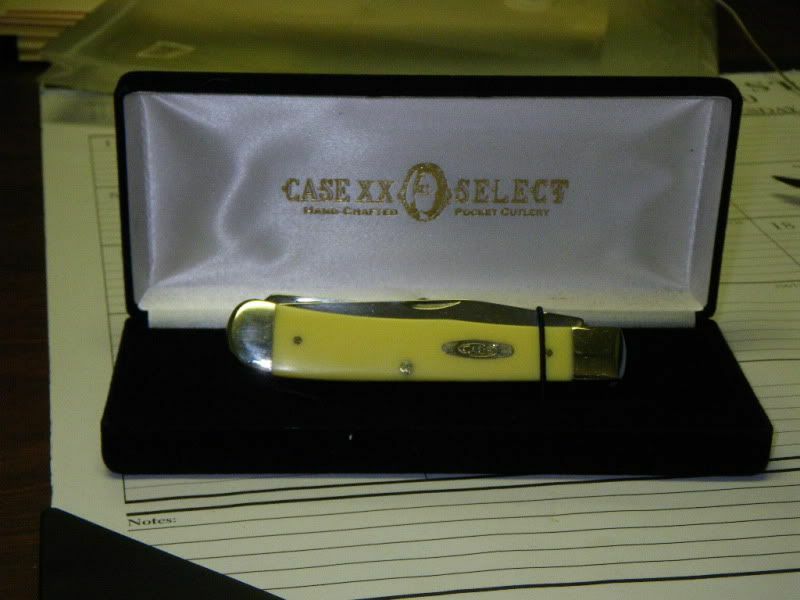 In conclusion, if you like Case knives then maybe stop into your local Wally World and ask them to dig, because they do stock them, and evidently, most folks don't go to Wally World to look for Case knives. Their Timmy Tacticals seem to move well, but the Case knives languish to the point where they get discontinued. Discontinued means clearance. That means a pretty damn great deal on a nice knife.